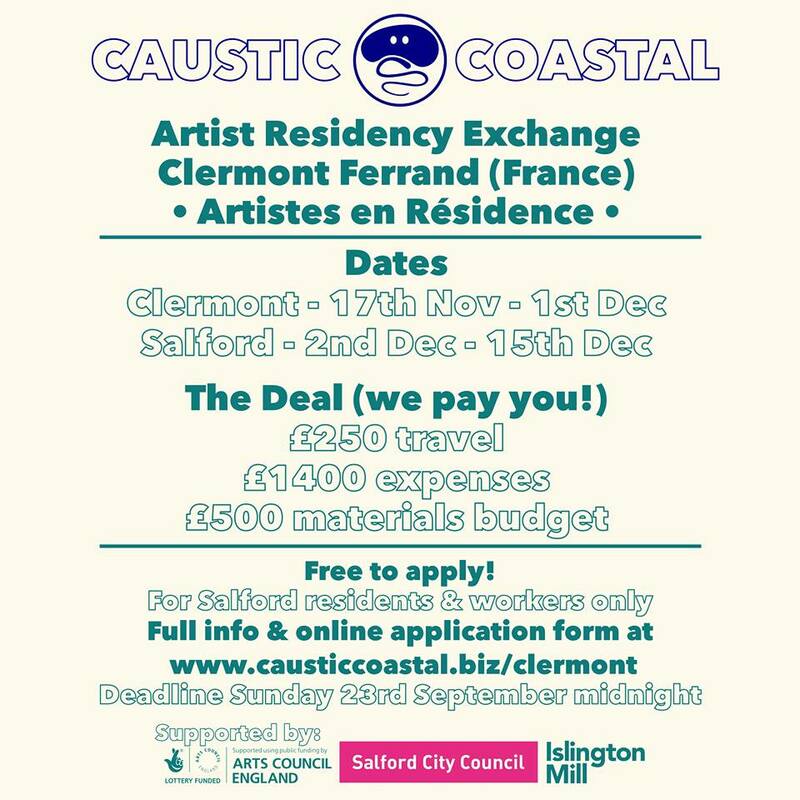 Caustic Coastal is partnering with Artistes en Résidence in Salford’s twinned town of Clermont Ferrand (France) to provide an artist residency exchange for 2 visual artists* living in or working from Salford. The residency will provide 2 weeks free studio space and living accommodation in Clermont Ferrand, France for 2 artists between the 17th November & 1st December at Artistes en Résidence. Artists must be available to travel and stay in Clermont for all of or the majority of the provided dates. Applications are for people living or working in Salford only. 2 artists from Clermont will be selected by Artistes en Résidence to stay and work in Salford at Caustic Coastal between 2nd-15th December. All 4 artists will be provided with space in their supporting town to work with the exchange artists, providing artistic and critical support, alongside vital local knowledge. The exchange is as much about providing time to spend in a new town to make work as it is to work with and around practitioners from the host town forming new creative relationships. Supported by Salford City Council’s town twinning committee and Arts Council England we are able to pay: £250 travel expenses, £1400 expenses to spend throughout the residency, and £500 materials budget for the production of artwork. Applicants will be selected by staff members from Caustic Coastal & Islington Mill. Interviews to take place during the first week of October. Mentoring and support provided throughout for the selected artists. *we will accept applications from creatives working broadly in the visual arts – for instance writers, designers, makers, performers, theatre practitioners. The residency is not suitable for musicians.